For other uses, see SPARC (disambiguation). SPARC (Scalable Processor Architecture) is a reduced instruction set computing (RISC) instruction set architecture (ISA) originally developed by Sun Microsystems. Its design was strongly influenced by the experimental Berkeley RISC system developed in the early 1980s. First released in 1987, SPARC was one of the most successful early commercial RISC systems, and its success led to the introduction of similar RISC designs from a number of vendors through the 1980s and 90s. The first implementation of the original 32-bit architecture (SPARC V7) was used in Sun's Sun-4 workstation and server systems, replacing their earlier Sun-3 systems based on the Motorola 68000 series of processors. SPARC V8 added a number of improvements that were part of the SuperSPARC series of processors released in 1992. SPARC V9, released in 1993, introduced a 64-bit architecture and was first released in Sun's UltraSPARC processors in 1995. Later, SPARC processors were used in symmetric multiprocessing (SMP) and non-uniform memory access (CC-NUMA) servers produced by Sun, Solbourne and Fujitsu, among others. The design was turned over to the SPARC International trade group in 1989, and since then its architecture has been developed by its members. SPARC International is also responsible for licensing and promoting the SPARC architecture, managing SPARC trademarks (including SPARC, which it owns), and providing conformance testing. SPARC International was intended to grow the SPARC architecture to create a larger ecosystem; SPARC has been licensed to several manufacturers, including Atmel, Bipolar Integrated Technology, Cypress Semiconductor, Fujitsu, Matsushita and Texas Instruments. Due to SPARC International, SPARC is fully open, non-proprietary and royalty-free. As of September 2017, the latest commercial high-end SPARC processors are Fujitsu's SPARC64 XII (introduced in 2017 for its SPARC M12 server) and SPARC64 XIfx (introduced in 2015 for its PRIMEHPC FX100 supercomputer); and Oracle's SPARC M8 introduced in September 2017 for its high-end servers. On Friday, September 1, 2017, after a round of layoffs that started in Oracle Labs in November 2016, Oracle terminated SPARC design after the completion of the M8. Much of the processor core development group in Austin, Texas, was dismissed, as were the teams in Santa Clara, California, and Burlington, Massachusetts. SPARC development continues with Fujitsu returning to the role of leading provider of SPARC servers, with a new CPU due in the 2020 time frame. The SPARC architecture was heavily influenced by the earlier RISC designs, including the RISC I and II from the University of California, Berkeley and the IBM 801. These original RISC designs were minimalist, including as few features or op-codes as possible and aiming to execute instructions at a rate of almost one instruction per clock cycle. This made them similar to the MIPS architecture in many ways, including the lack of instructions such as multiply or divide. Another feature of SPARC influenced by this early RISC movement is the branch delay slot. The SPARC processor usually contains as many as 160 general purpose registers. According to the "Oracle SPARC Architecture 2015" specification an "implementation may contain from 72 to 640 general-purpose 64-bit" registers. At any point, only 32 of them are immediately visible to software — 8 are a set of global registers (one of which, g0, is hard-wired to zero, so only seven of them are usable as registers) and the other 24 are from the stack of registers. These 24 registers form what is called a register window, and at function call/return, this window is moved up and down the register stack. Each window has 8 local registers and shares 8 registers with each of the adjacent windows. The shared registers are used for passing function parameters and returning values, and the local registers are used for retaining local values across function calls. The "Scalable" in SPARC comes from the fact that the SPARC specification allows implementations to scale from embedded processors up through large server processors, all sharing the same core (non-privileged) instruction set. One of the architectural parameters that can scale is the number of implemented register windows; the specification allows from three to 32 windows to be implemented, so the implementation can choose to implement all 32 to provide maximum call stack efficiency, or to implement only three to reduce cost and complexity of the design, or to implement some number between them. Other architectures that include similar register file features include Intel i960, IA-64, and AMD 29000. The architecture has gone through several revisions. It gained hardware multiply and divide functionality in Version 8. 64-bit (addressing and data) were added to the version 9 SPARC specification published in 1994. In SPARC Version 8, the floating point register file has 16 double-precision registers. Each of them can be used as two single-precision registers, providing a total of 32 single precision registers. An odd-even number pair of double precision registers can be used as a quad-precision register, thus allowing 8 quad precision registers. SPARC Version 9 added 16 more double precision registers (which can also be accessed as 8 quad precision registers), but these additional registers can not be accessed as single precision registers. No SPARC CPU implements quad-precision operations in hardware as of 2004. Tagged add and subtract instructions perform adds and subtracts on values checking that the bottom two bits of both operands are 0 and reporting overflow if they are not. This can be useful in the implementation of the run time for ML, Lisp, and similar languages that might use a tagged integer format. The endianness of the 32-bit SPARC V8 architecture is purely big-endian. The 64-bit SPARC V9 architecture uses big-endian instructions, but can access data in either big-endian or little-endian byte order, chosen either at the application instruction (load-store) level or at the memory page level (via an MMU setting). The latter is often used for accessing data from inherently little-endian devices, such as those on PCI buses. There have been three major revisions of the architecture. The first published version was the 32-bit SPARC Version 7 (V7) in 1986. SPARC Version 8 (V8), an enhanced SPARC architecture definition, was released in 1990. The main differences between V7 and V8 were the addition of integer multiply and divide instructions, and an upgrade from 80-bit "extended precision" floating-point arithmetic to 128-bit "quad-precision" arithmetic. SPARC V8 served as the basis for IEEE Standard 1754-1994, an IEEE standard for a 32-bit microprocessor architecture. SPARC Version 9, the 64-bit SPARC architecture, was released by SPARC International in 1993. It was developed by the SPARC Architecture Committee consisting of Amdahl Corporation, Fujitsu, ICL, LSI Logic, Matsushita, Philips, Ross Technology, Sun Microsystems, and Texas Instruments. Newer specifications always remain compliant with the full SPARC V9 Level 1 specification. In 2002, the SPARC Joint Programming Specification 1 (JPS1) was released by Fujitsu and Sun, describing processor functions which were identically implemented in the CPUs of both companies ("Commonality"). The first CPUs conforming to JPS1 were the UltraSPARC III by Sun and the SPARC64 V by Fujitsu. Functionalities which are not covered by JPS1 are documented for each processor in "Implementation Supplements". At the end of 2003, JPS2 was released to support multicore CPUs. The first CPUs conforming to JPS2 were the UltraSPARC IV by Sun and the SPARC64 VI by Fujitsu. 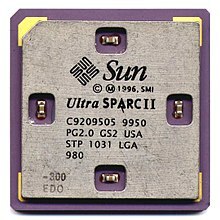 In 2007, Sun released an updated specification, UltraSPARC Architecture 2007, to which the UltraSPARC T2 implementation complied. In August 2012, Oracle Corporation made available a new specification, Oracle SPARC Architecture 2011, which besides the overall update of the reference, adds the VIS 3 instruction set extensions and hyperprivileged mode to the 2007 specification. SPARC architecture has provided continuous application binary compatibility from the first SPARC V7 implementation in 1987 through the Sun UltraSPARC Architecture implementations. Among various implementations of SPARC, Sun's SuperSPARC and UltraSPARC-I were very popular, and were used as reference systems for SPEC CPU95 and CPU2000 benchmarks. The 296 MHz UltraSPARC-II is the reference system for the SPEC CPU2006 benchmark. Sun SME1832 2300 ???? canceled 2×16=32 65 ? 396 2326 ? ? 32 32 2048 ? ^ Various SPARC V7 implementations were produced by Fujitsu, LSI Logic, Weitek, Texas Instruments, Cypress and Temic. A SPARC V7 processor generally consisted of several discrete chips, usually comprising an integer unit (IU), a floating-point unit (FPU), a memory management unit (MMU) and cache memory. Conversely, the Atmel (now Microchip Technology) TSC695 is a single-chip SPARC V7 implementation. SPARC machines have generally used Sun's SunOS, Solaris, or OpenSolaris including derivatives illumos and OpenIndiana, but other operating systems have also been used, such as NeXTSTEP, RTEMS, FreeBSD, OpenBSD, NetBSD, and Linux. In 1993, Intergraph announced a port of Windows NT to the SPARC architecture, but it was later cancelled. In October 2015, Oracle announced a "Linux for SPARC reference platform". LEON, a 32-bit, SPARC Version 8 implementation, designed especially for space use. Source code is written in VHDL, and licensed under the GPL. OpenSPARC T1, released in 2006, a 64-bit, 32-thread implementation conforming to the UltraSPARC Architecture 2005 and to SPARC Version 9 (Level 1). Source code is written in Verilog, and licensed under many licenses. Most OpenSPARC T1 source code is licensed under the GPL. Source based on existent open source projects will continue to be licensed under their current licenses. Binary programs are licensed under a binary software license agreement. S1, a 64-bit Wishbone compliant CPU core based on the OpenSPARC T1 design. It is a single UltraSPARC v9 core capable of 4-way SMT. Like the T1, the source code is licensed under the GPL. OpenSPARC T2, released in 2008, a 64-bit, 64-thread implementation conforming to the UltraSPARC Architecture 2007 and to SPARC Version 9 (Level 1). Source code is written in Verilog, and licensed under many licenses. Most OpenSPARC T2 source code is licensed under the GPL. Source based on existing open source projects will continue to be licensed under their current licenses. Binary programs are licensed under a binary Software License Agreement. RAMP Gold, a 32-bit, 64-thread SPARC Version 8 implementation, designed for FPGA-based architecture simulation. RAMP Gold is written in ~36,000 lines of SystemVerilog, and licensed under the BSD licenses. For HPC loads Fujitsu builds specialized SPARC64 fx processors with a new instruction extensions set, called HPC-ACE (High Performance Computing – Arithmetic Computational Extensions). Fujitsu's K computer ranked No. 1 in the TOP500 June 2011 and November 2011 lists. It combines 88,128 SPARC64 VIIIfx CPUs, each with eight cores, for a total of 705,024 cores—almost twice as many as any other system in the TOP500 at that time. The K Computer was more powerful than the next five systems on the list combined, and had the highest performance-to-power ratio of any supercomputer system. It also ranked No. 6 in the Green500 June 2011 list, with a score of 824.56 MFLOPS/W. In the November 2012 release of TOP500, the K computer ranked No. 3, using by far the most power of the top three. It ranked No. 85 on the corresponding Green500 release. Newer HPC processors, IXfx and XIfx, were included in recent PRIMEHPC FX10 and FX100 supercomputers. Tianhe-2 (TOP500 No. 1 as of November 2014) has a number of nodes with Galaxy FT-1500 OpenSPARC-based processors developed in China. However, those processors did not contribute to the LINPACK score. LEON — a space rated SPARC V8 processor. ^ Steven J. Vaughan-Nichols (September 5, 2017). "Sun set: Oracle closes down last Sun product lines". ZDNet. ^ Shaun Nichols (August 31, 2017). "Oracle finally decides to stop prolonging the inevitable, begins hardware layoffs". The Register. ^ "SPARC AND SOLARIS, THE PAST AND THE FUTURE - Tales from the Datacenter". Tales from the Datacenter. October 30, 2017. Retrieved January 23, 2018. ^ a b "Oracle SPARC Architecture 2015: One Architecture ... Multiple Innovative Implementations" (PDF). Draft D1.0.0. January 12, 2016. Retrieved June 13, 2016. IMPL. DEP. #2-V8: An Oracle SPARC Architecture implementation may contain from 72 to 640 general-purpose 64-bit R registers. This corresponds to a grouping of the registers into MAXPGL + 1 sets of global R registers plus a circular stack of N_REG_WINDOWS sets of 16 registers each, known as register windows. The number of register windows present (N_REG_WINDOWS) is implementation dependent, within the range of 3 to 32 (inclusive). ^ "SPARC Behavior and Implementation". Numerical Computation Guide – Sun Studio 10. Sun Microsystems, Inc. 2004. Retrieved September 24, 2011. There are four situations, however, when the hardware will not successfully complete a floating-point instruction: ... The instruction is not implemented by the hardware (such as ... quad-precision instructions on any SPARC FPU). ^ John Soat. "SPARC M7 Innovation". Oracle web site. Oracle Corporation. Retrieved October 13, 2015. ^ "Software in Silicon Cloud - Oracle". www.oracle.com. ^ "Ixfx Download" (PDF). fujitsu.com. ^ "Images of SPARC64" (PDF). fujitsu.com. Retrieved August 29, 2017. ^ "Oracle Products" (PDF). oracle.com. Retrieved August 29, 2017. ^ "Oracle SPARC products" (PDF). oracle.com. Retrieved August 29, 2017. ^ "Fujitsu Presentation pdf" (PDF). fujitsu.com. Retrieved August 29, 2017. ^ "Fujitsu Global Images" (PDF). fujitsu.com. Archived from the original (PDF) on May 18, 2015. Retrieved August 29, 2017. ^ "M7: Next Generation SPARC. Hotchips 26" (PDF). swisdev.oracle.com. Retrieved August 12, 2014. ^ "Oracle's SPARC T7 and SPARC M7 Server Architecture" (PDF). oracle.com. Retrieved October 10, 2015. ^ "Hot Chips – August 23–25, 2015 – Conf. Day1 – Oracle's Sonoma Processor: Advanced low-cost SPARC processor for enterprise workloads by Basant Vinaik and Rahoul Puri" (PDF). hotchips.org. Retrieved August 23, 2015. ^ "Blueprints revealed: Oracle crams Sparc M7 and InfiniBand into cheaper 'Sonoma' chips". theregister.co.uk. Retrieved August 29, 2017. ^ "Documents at Fujitsu" (PDF). fujitsu.com. Retrieved August 29, 2017. ^ "Oracle's New SPARC Systems Deliver 2-7x Better Performance, Security Capabilities, and Efficiency than Intel-based Systems". oracle.com. Retrieved September 18, 2017. ^ "SPARC M8 Processor" (PDF). oracle.com. Retrieved September 18, 2017. Wikimedia Commons has media related to SPARC microprocessors. This page was last edited on 28 February 2019, at 18:30 (UTC).